Baba Ghannoug is served in many countries of the Mediterranean and under various names. In Turkey, it is known as patlican salatasi. In Greece, melitzanosalata. It is often served as a dip or salad and its base is roasted, pureed eggplant. This is the traditional Levantine variation but you can also add onion, mint, or other roasted vegetables. Preheat the oven to 200 C (400 F). Put the whole eggplants on a baking sheet and bake for 45 minutes. Remove the eggplants, let cool, and peel off the skin. Then add all of the ingredients into a food processor or blender and blend until smooth. Serve with pita bread. I REALLY want to try this. Two questions: What size of eggplants would you suggest? And what kind of vinegar do you like to use? Hey Amber. 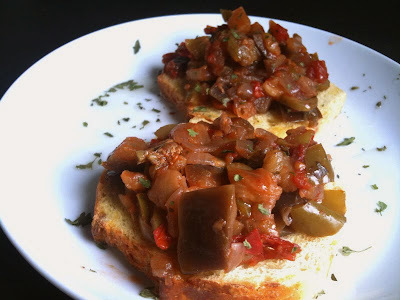 I used small-medium size eggplants for this recipe. I would suggest a white wine vinegar though I just used what I had (apple cider vinegar) and it tastes fine! Hope you like it.